Once a while you may somehow want to recover permanently deleted email in the “Deleted Items” folder in your Microsoft outlook, this tip will come handy. You can run “regedit” command from the start “run” windows. The Registry Editor program will appear. (4) Click OK and close your registry windows. (5) Restart your MS Outlook. After you click the "Recover Deleted Items", a dialogue box will appear for you to select the email that you would like to recover. 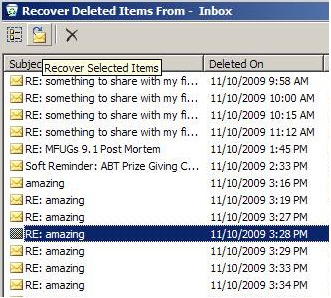 Highlight the email and click "Recover Selected Items" button on the top. P/S: This is only applicable if your Microsoft exchange server has enabled this feature. 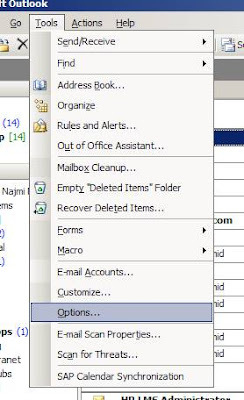 Usually your admin will only enable this feature for the “Deleted Items” folder and the retention time is up to the admin to set. If the retention time is set to 7 days, you can recover hard deleted items up tot the past 7 days. You can also try this for other folders such as "Inbox" or "Send" folder. It may work as well. Good luck! Note: If you're lazy to manually fix this through registry editor, there is a simple way to just run the program to automatically fix it for you. Refer to this article Q246153 from Microsoft.